"There's nothing more that haunts you than the things you didn't buy..." - Says everyone. Luckily for me (and thanks to PG), I now own these. Espadrilles aren't new on the scene, they've been a fashion staple for the masses for a couple of summers however, to me, now that I'm in acceptance of a flat, they are. 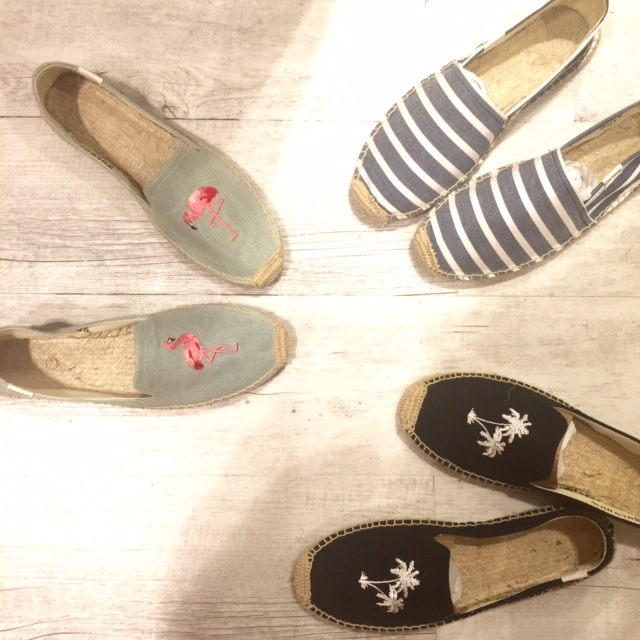 I'd eyed up these espadrilles in the Apoella store within the Daios Cove Resort when we were away...Everyday I'd walk by the window and my eyes met with these corkers. They tick a whole load of boxes for me, mainly practical, secondly just pretty...I love the fact that the flamingos differ on each shoe too. I went up a size in these as they are fairly narrow and because, in the summer my feet go all Professor Clump. They are so insanely comfy and a good 'closed-toe' alternative to the Converse/Ghillie flat that I've been living in this summer. These were the shortlist in the store.. Life is so full of tough decisions. You can buy the Flamingo ones here. Classic stripes here. Palm trees here. I've worn the Flamingos a couple of times and as soon as the temperature drops slightly, I'll be wearing them with the uniform that is, battered boyfriend jeans. What do you think? Which ones would you have gone with? Love all ! Yours are a great statement!